This peat-based soil contains pumice and our own in-house perlite. Begin feeding 10 to 14 days after transplanting for vigorous fruiting and flowering plants. Great vegetable and outdoor growing mix. Green Fields can be placed directly in a container with drainage holes. Place enough Green Fields soil in the pot to allow the top of the plant’s root ball to be about two inches below the rim of the pot. Add more soil, firming with hands until within one inch of rim. Insert support if necessary. Water transplant thoroughly, using a light fertilizer solution if desired. When plants are moved from one stage to another, such as from cuttings to pots or when transplanting one size up, reduce fertilizing until they show signs of growth again. 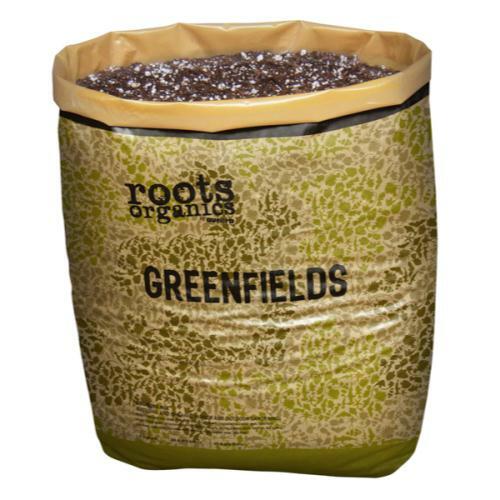 Roots Organics GreenFields is an ocean-nutrient-based growing mix designed for both the vegetative-and flowering phases of mature plants. GreenFields was designed with greater water-holding capacity, yet it is free-draining for frequent feeding of fast-growing, heavy feeding plants. GreenFields is a ready-to-use soil created with less perlite and pumice and specific ingredients such as fish meal and crab meal, worm castings, bat guano and kelp meal. Experienced gardeners know that a perfect outdoor mix is different than a perfect indoor mix and Green Fields has been proven as an excellent outdoor blend for your fast-growing plants.